The great thing about patchwork is that you can create unique sewing projects with fabric pieces often loaded with memories! Cut out paper template measuring 6cm square. Place this on a mixed selection of fabrics and cut out 25 squares. Lay them face up in 5 rows of 5 squares, moving the different fabrics around until you have an arrangement you are happy with. It is good to choose a variety of fabric patterns – prints, stripes dots, flowers and plains. Pin the fabrics together in strips of 5 squares, taking a seam allowance of 5mm. Machine-stitch the squares together, then press the seams open and closed alternately. This will make it easier to cross-match the rows in step 3. Pin the 5 strips together to make a large square, matching the seams accurately and taking a 5mm seam allowance. Sew the strips together and press the seams open. You now have the patchworked front of your cover. Cut a piece a calico and a piece of wadding to the same size as the patchwork. Sit the wadding on the calico, then place the patchwork face up on the wadding. Take the three layers together, Pin or draw diagonal lines across the patchwork, making sure they go through the points where 4 squares meet. These are your quilting lines. Tack together and remove the pins. Machine-stitch along these lines, through all 3 layers, then remove the tacking threads. For the borders, cut 2 strips of plain fabric measuring 4x26cm and 2 strips measuring 4x32cm. Pin the shorter strips to the sides of the patchwork front, taking 5 mm seam. Stitch in place and press the seam open. Pin the 2 longer strips along the the top and bottom of the patchwork front and stitch in place. Press the seams open. Trim away any excess wadding and calico. To make the back of the cover, cut out 2 pieces of plain fabric measuring 32×21 cm. Fold over a 5mm double hem on 1 longer side of each rectangle. Pin in place, press and stitch. Overlap the 2 rectangles by 9 cm, with the hemmed edges towards the centre. This should make a square the same size as the front of the cover. Pin the 2 rectangles together through the overlap to hold them together. Place the front and back cover pieces right sides together. Pin around all 4 sides, taking a 5mm seam allowance, then stitch. Run the machine back and forth across the overlap a few times to reinforce the opening. Remove pins. Clip the corners diagonally to reduce the bulk. Turn the cushion cover right side out and insert the cushion pad through the envelope opening on the back. 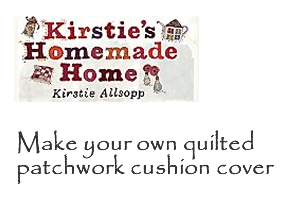 Source: Kirstie’s Homemade Home Book.